On Wednesday afternoon, members and supporters of ACT UP (AIDS Coalition to Unleash Power) gathered in front of Mt. Sinai Hospital to demand better access to Post-Exposure Prophylaxis, commonly known as PEP, a drug that people can take after possible HIV exposure that greatly reduces the risk of infection. The group, known for daring attention-getting tactics during its heyday in the 1980s and 1990s, has grown calmer, but remains determined to save lives with direct action. People marched back and forth in front of the hospital entrance around lunchtime, carrying large posters with the image of a set of lips and the word “PEP” emblazoned in a heart across the middle. Organizers had prepared a series of chants, such as “Sinai ER get a clue: PEP for all, not just for you,” referencing the fact that PEP is readily available for hospital employees while patients often have trouble getting treatment. ACT UP planned the rally in response to an incident a few weeks ago where a gay man who suspected that he had been recently exposed went to Mt. Sinai for treatment. He spoke to nurses there who all claimed to be unaware of the medicine; the man eventually got help from the hospital only after calling ACT UP, who intervened on his behalf, but lost precious time in waiting for the time-sensitive drug. 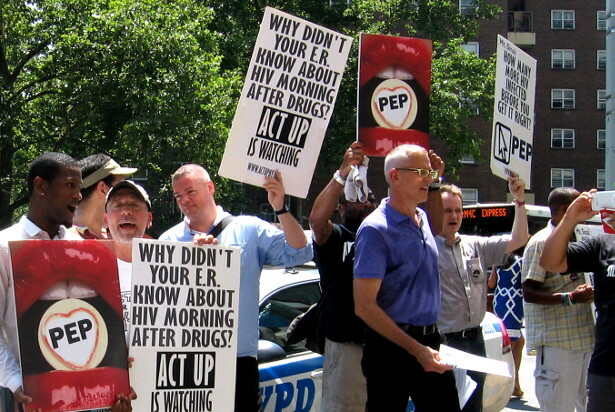 ACT UP perceives there to be a lack of access to PEP or informational materials about the medication across New York City. ACT UP member Steven Helmke remarked that “What happened at Mt. Sinai isn’t extraordinary; it is all too ordinary.” As a result, ACT UP is campaigning to ensure adequate information and access to preventative measures. While the turnout at Wednesday’s event was small, it showed the group’s commitment to remain vigilant and creative in ensuring medical treatment for those in need. The fact that the group has maintained its presence over 26 years and has effectively transformed its focus from treatment to prevention is a sign of its resilience and continued power. Ali Roseberry-Polier is an intern at Waging Nonviolence. naturally like your web page however you ought to examine the transliteration upon a good number of of this blogposts. Some of them are usually rife with spelling difficulties and that i in finding the idea very troublesome to share with the fact on the other hand I am going to certainly go back yet again.